Peanut butter and coffee?! Promise it’s a thing! 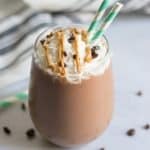 This smooth and creamy Peanut Butter Mocha Smoothie is a simple and delicious reason to get up in the morning! I have worked at a couple of coffee shops in my life–once before Starbucks was really a thing and a second time when coffee became the very coolest thing around. Two very different experiences but both connected to my true love of the little roasted beans. I LOVE coffee shops. The connections, the chatting, and of course, the coffee! The time I spent working at each of the two shops holds so many great memories and friendships that I never anticipated along the way. Coffee is a way to connect, a way to unite, one sip at a time. Peanut Butter and Coffee?? Seriously?! Please stay with me, I promise it’s a thing. I used to have a few customers that would order Peanut butter flavored syrup in their coffee drinks. And boy oh boy, in my mind, I stuck my nose up in the air and thought they were CRAZY. You guys know of my love of peanut butter but even I have to draw the line somewhere and coffee was definitely my line. This recipe is a perfect reminder that you really shouldn’t knock it til you try it. I was floored by the combo and sip after sip, I kept thinking, why did I wait so long?! 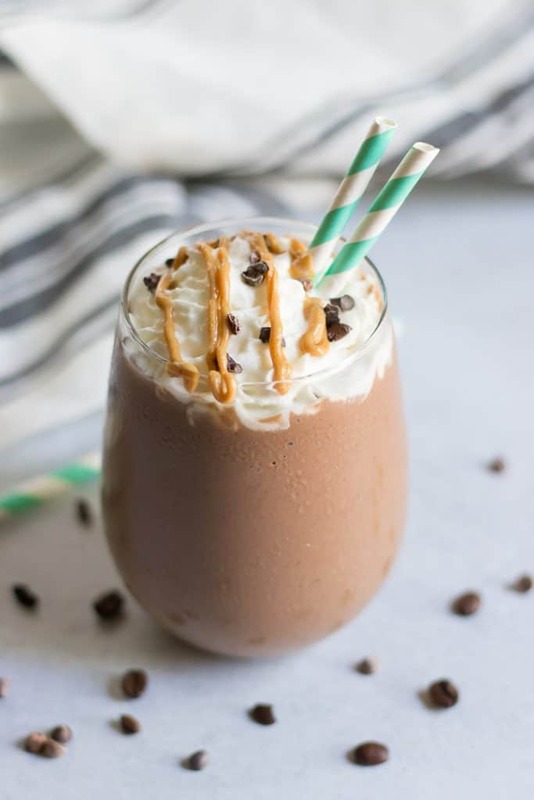 Somehow the sweetness of the chocolate, the saltiness of the peanut butter and then the coffee makes sense even though the thought of it just does not. If you are like me, you go through smoothie phases. I get on a big kick and make a certain flavor consistently for a few weeks and then switch to something else. Aside from my Anti-Inflammatory Blueberry Smoothie, this smoothie now has one of my longest streaks and I have not tired of it one bit. I think the main reason for this the fact that it contains my morning cup of joe along with some fuel to start chasing after Sam right away in the morning–but also because it is delish, of course! I also love that there is a lot of wiggle room when it comes to this smoothie. I use the recipe as a good base, but also when I am in the mood to shake it up, I toss in some other fun options. There was a day when I believed that spinach or something green had to be part of every smoothie, but that is no longer. But if you are wanting some greens added to yours, by all means, add it. Just know the color will not be the same in any way. Toss in protein powder, chia seeds, whatever your heart desires into the blender, to give the smoothie a boost. 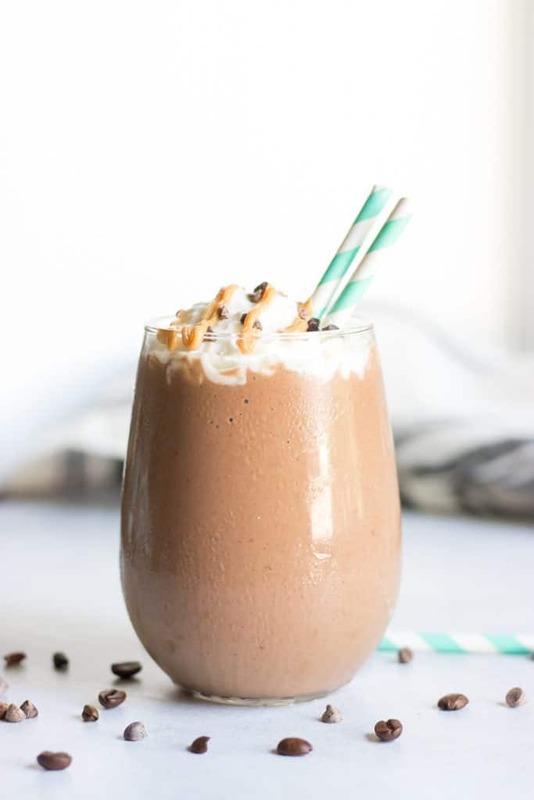 Just don’t skip on the coffee, peanut butter or chocolate, otherwise it won’t be a Peanut Butter Mocha Smoothie! Blend on high until smooth and serve immediately. 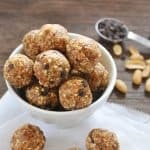 Optional add ins: cacao nibs, chia seeds, protein powder, and more! *the stronger or more concentrated the coffee is, the better. Also as long as it's not hot, you are fine. You could use espresso shots but you will want to add a bit more liquid to balance it out. **Any sweetener will work fine. I like that the dates add a little more thickness to the smoothie. Looks unreal! I am going to try it with coconut yoghurt and see how it goes! Hope you love it Ana! Yes, people are serious about their coffee and know what they love. This is definitely a must make in my book! Oh my heavens, you really got me with that pb drizzle on top! I think I might have to make one of these sans coffee. Add more liquid and you should be good! This combination is a dessert lovers dream! 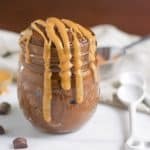 The peanut butter and mocha together make the perfect smoothie for anyone!!! This looks like a little slice of heaven! And I can so picture you as the coolest barista in town! Ha, one of my favorite jobs by far! I laughed so hard at “EX-presso” 😂but this smoothie looks delish and I can’t wait to try it!! This looks really good but I would have never thought to combine these ingredients. I will have to try it!